There’s a movement taking place right now in the world of touring bicycles. Throngs of individuals are changing from their traditional 700c and 26 inch bicycles to the new 650b wheel/tire size – a wheel/tire size that is said to ride like a 700c road wheel, but is capable of handling the off-road terrain that has, up until this point, been best suited for a bike with 26 inch wheels and tires. I wanted to see what all the fuss was about with this new 650b wheel/tire size, so I got myself a brand new Co-Motion Cycles Siskiyou touring bicycle and have been riding it around the world for the last year now. 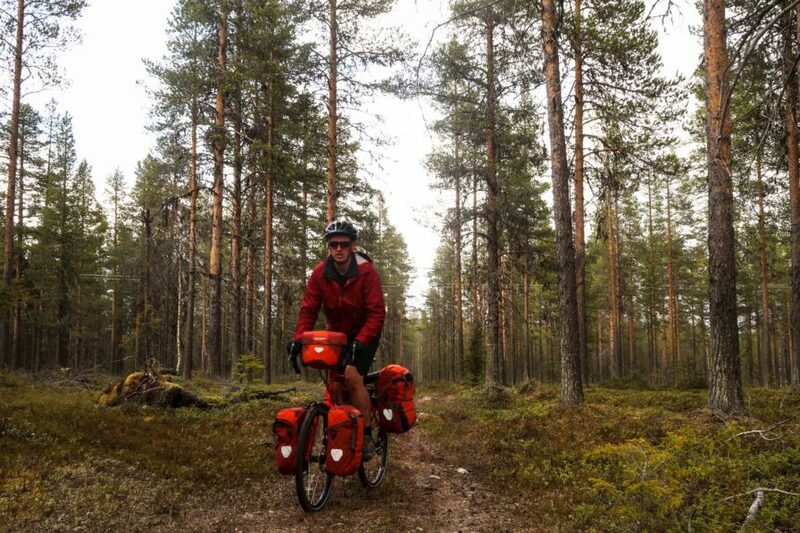 In the last 12 months I’ve cycled across Sweden, Finland, Norway and several different US States on my Co-Motion Siskiyou and I’ll be taking my this bike back to Europe with me this summer as I cycle across Portugal, the Czech Republic, Slovakia and Poland as well. I’ve now got enough experience with the Co-Motion Siskiyou and its 650b wheels and tires that I think it’s time I sat down and wrote out my thoughts on this amazing 650b touring bicycle, which I had fitted with S&S couplers and a Pinion gearbox and Gates Carbon Drive System. Those that have been following me for the last several years know that before I got this new Co-Motion Siskiyou touring bicycle with the 650b wheels and tires, I was riding a Co-Motion Pangea touring bicycle, which was fitted with standard 26 inch wheels and tires. I loved my Pangea so much, that when it came time to look for a new touring bicycle, I opted for another Co-Motion bicycle. Truth be told, I didn’t really need a new bicycle. The Co-Motion Pangea is an amazing bicycle and I love it. Anyone who has ever read my detailed review of that Co-Motion Pangea knows that I’m a hard-core fan. The only reason I got this new Co-Motion Siskiyou touring bicycle is because I wanted to see if 650b wheels and tires were all they were made out to be. There’s a big trend taking place right now toward 650b wheels and tires… and I wanted to see if there was anything to be said about this sudden swing toward this irregular wheel/tire size. I’ll talk about the 650b wheels and tires in just a moment, but first, let’s take a look at the frame and fork on the Co-Motion Siskiyou touring bicycle. The frame and fork on the Siskiyou is made of super tough, large diameter 725 Reynolds steel. The bicycle’s steel frame makes for a strong vehicle capable of carrying heavy loads, yet is flexible enough to provide you with a comfortable ride – something that’s super important when you spend hours and hours in the saddle each day, riding for days, weeks or months on end. At the rear end of the frame, long touring-specific chainstays allow you to mount rear panniers of almost any size to the rear rack of the bicycle without you having to worry about the heel of your foot interfering with the front portion of the panniers while you ride (a common problem on many touring bicycles, but not the Siskiyou). The Siskiyou’s frame is available in eight ready-to-order sizes (46cm, 50cm, 52cm, 54cm, 56cm, 58cm, 60 cm and 62cm). One of the things that makes ordering a Co-Motion bicycle different than purchasing a stock bike made overseas is that the company goes above and beyond to make sure you get the correctly sized bicycle for your needs. This means that before you even complete your order for a bike with Co-Motion, all your measurements will be taken and an in-depth analysis of your body dimensions will be performed. 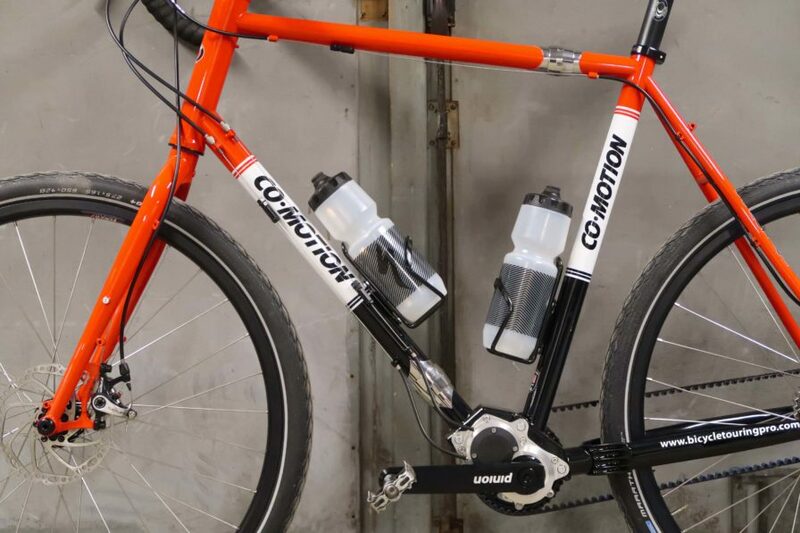 If Co-Motion determines that you need a custom bicycle frame (maybe because you are either very tall or have really short legs), the company will provide you with a frame that has been customized specifically for you. Finally, when it comes to having the braze-ons needed to mount water bottle cages, fenders and front and rear racks, the Co-Motion Siskiyou comes fully-equipped. Not only are there mounting points on both the front and rear ends of the Siskiyou frame for racks and fenders, but the bicycle is equipped with mounts for two water bottle cages as well. The main thing that differentiates the Co-Motion Siskiyou touring bicycle from the other single-person bicycles in the Co-Motion Cycles line-up is that the Siskiyou is equipped with 650b wheels and tires. If you’re unfamiliar with the 650b wheel/tire size, then I highly recommend you watch the following video, which was produced by the Global Cycling Network and does a pretty good job ox explaining how 650b is different from the 700c wheels/tires you might be used to seeing on so many road and touring bike models. In the video, you will learn that a 650b wheel has a rim diameter of 584mm, while a 700c wheel has a rim diameter of 622mm. The advantage to having a smaller rim is that without making any dramatic changes to the design of a 700c bicycle, you can fit a much larger tire on a a bike that uses a 650b wheel. Therefore, a 650b wheel may be slightly smaller than 700c wheel, but it has a larger tire, which is better suited for off-road riding. And because the tire on a 650b bicycle is larger than that of the tires found on 700c bicycles, the outside diameter length of these two wheel/tire sizes is almost identical. That means you can keep the geometry and handling characteristics of a 700c road bike, but because of the added tire volume found on 650b bicycles, you’re not restricted to riding only on paved roads. So, how exactly does the Co-Motion Siskiyou feel when you’re riding it with those non-standard 650b wheels and tires? To be completely honest, it feels a lot like a traditional 700c road bicycle. The riding position is ridged and upright, while being both firm and fast. If you were to remove the racks and fenders from the Siskiyou and stand back at a distance, you’d have a hard time telling it was not a traditional road bike (unless you looked closely at the tires). The fact that the Co-Motion Siskiyou and its 650b wheels and tires feel a lot like a 700c road bicycle is a good thing, because most people conducting a bicycle tour spend the vast majority of their time cycling on paved roads. The wider contact patch on the 650b tires does require a small amount of extra energy in order to move them forward over the pavement, but when it comes to riding off-road, the Siskiyou really shines. 700c wheels and tires are great for road-based bike tours. 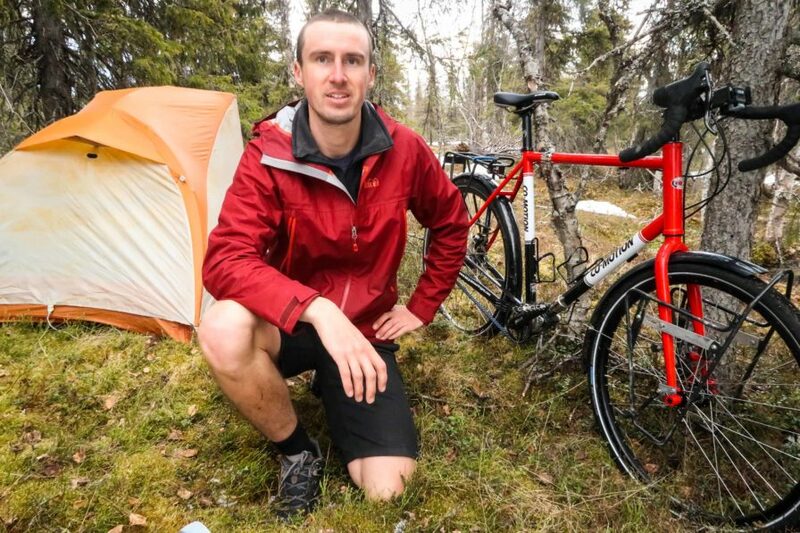 And while 26 inch tires have been used for years as the ideal choice for off-road bicycle touring adventures, there’s been a movement in recent years towards larger, fatter tires. Now, the 650b offers the perfect in-between tire option for those who want something that is best ridden on paved roads, but can also handle a fair amount of off-road riding. The only major downside to using a touring bicycle with 650b wheels and tires at this point in time is that this particular wheel/tire size is not available in most bike shops around the world. While 26 inch wheels and tires can be found almost anywhere, 700c wheels and tires are usually only available in more modern locales… and 650b wheels and tires are so new, that they’re really only available in specialized shops in limited locations around the world. This means that if you were to go on a bike tour in a remote corner of the world and you needed to purchase a new tire, tube, rim, wheel or spoke for your 650b bicycle, you might not be able to find the parts you need to repair your bike and continue on your way. 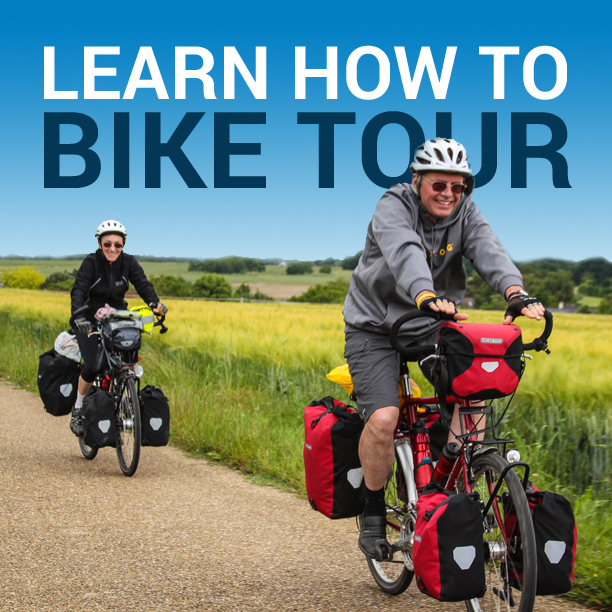 You may have to have the parts shipped to you, which could delay your bike tour by several days or weeks, or put an end to your bike tour entirely. 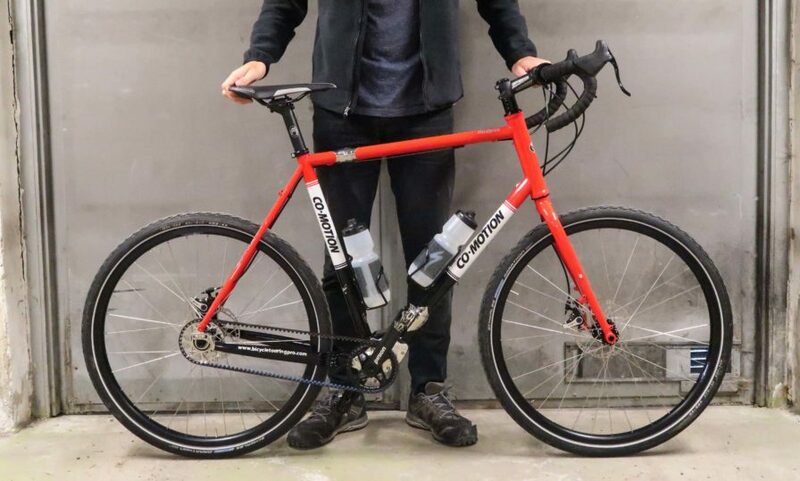 When I first purchased my Co-Motion Siskiyou touring bicycle, I brought it into five different bike shops in my local area in Southern California and asked if they had any wheels, tubes or tires in the 650b size. None of them did! So, while I love the way these new 650b wheels perform on the Co-Motion Siskiyou, it does make me a little nervous riding a bicycle that uses a wheel/tire size that is so difficult to find at this point in time. Like all of Co-Motion’s bicycles… and like my previous Co-Motion Pangea touring bicycle, the Co-Motion Siskiyou is equipped with a pair of high-quality cable disc brakes. Or more specifically, TRP Spyre 160mm disc brakes. While traditional touring bicycles were designed with rim brakes because the parts for rim brakes are easier to find anywhere in the world, disc brakes have pretty much become the standard in the touring bike world. Almost every good touring bike is now equipped with a pair of disc brakes, but few bicycles have brakes as good as the ones on the Co-Motion Siskiyou. I opted to have S&S couplers installed on my Co-Motion Cycles Siskiyou touring bicycle… but you can order your bike with or without this option. If you don’t know what S&S couplers are, they are metal attachments/fasteners that are built into the frame of a bicycle that allow it to be split apart when it is being transported (via car, bus, boat, plane or train) and then easily put back together again when you are ready to ride the bike. I had S&S couplers installed on my Co-Motion Pangea touring bicycle and, while I was fearful at first that they might make the frame of my bicycle more likely to break, I found the S&S couplers were incredibly firm and, in the long run, saved me a lot of money when flying with my bike. To have S&S couplers installed on your Co-Motion bicycle, you should expect to pay somewhere close to $800 USD extra. But if you plan to fly with your bicycle quite frequently, the S&S couplers will pay themselves off rather quickly. Many airlines now charge between $75-$200 USD per direction to fly with a bicycle. But with S&S couplers and the Co-Motion travel case, you can fly now fly your bicycle for free as regular checked baggage! This is how I flew my bike to and from Europe this past summer and wasn’t charged even a single cent for the flying with my bike. And it’s how you can save money yourself when flying with your new bicycle in the future. Just imagine if you saved $100 each time you flew with your bike. If the S&S couplers cost $800 USD, you’d only have to fly with your bicycle 8 times (or 4 round trip flights) before they started to actually save you money! That’s why I chose to have S&S couplers installed on my Co-Motion Pangea and Siskiyou touring bicycles… and it’s why you should consider having them installed on your bike tour if you plan to fly with your bicycle quite frequently. Click here to learn more about Co-Motion’s S&S couplers and how they can be used to pack your bicycle inside the airline-friendly Co-Motion travel case. In addition to the 650b wheels and tires, another thing that makes the Co-Motion Cycles Siskiyou touring bicycle unique is the fact that it can be fitted with either a standard chain and derailleur setup, a Rohloff internal rear hub, or a Pinion gearbox with the additional Gates Carbon Drive System. 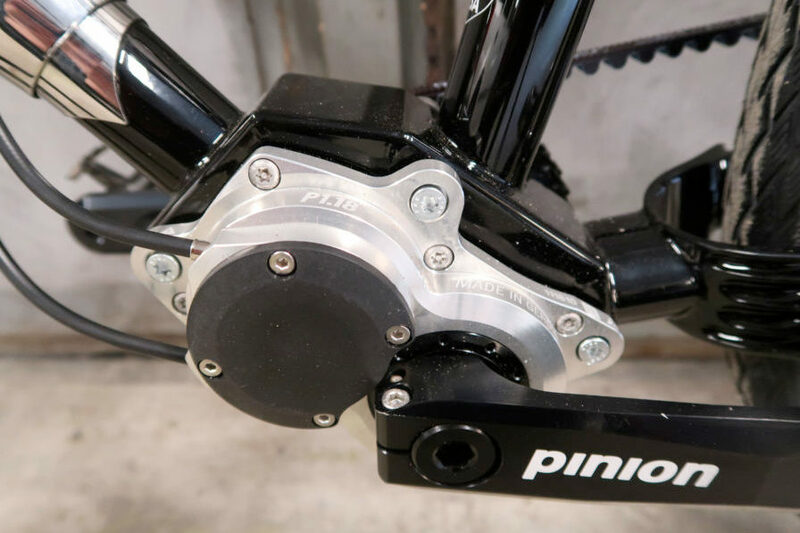 The Pinion gearbox, in case you don’t know, is a small metal box that is welded into the bottom bracket of your bicycle, and inside this box is fitted an internal gearing mechanism. In other words, instead of having your gearing on the outside of your bicycle like you see on most bicycles, the gearing is all contained inside this small, metal, waterproof box that’s welded into the bottom of your bicycle. 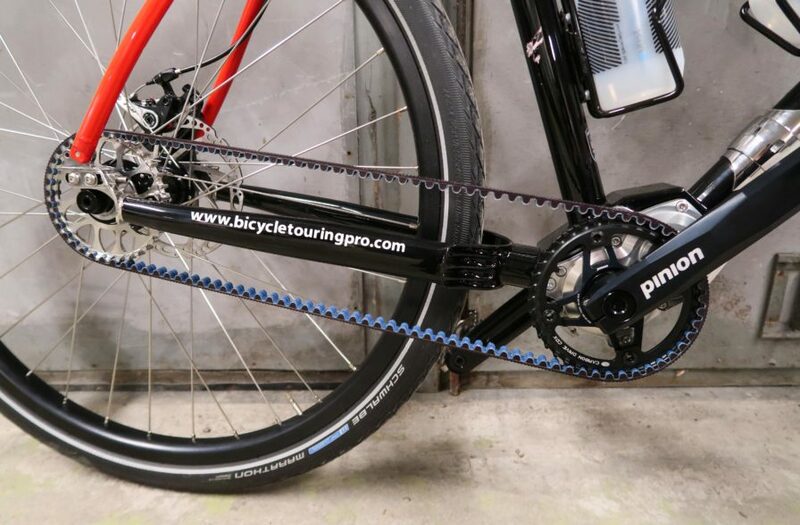 And instead of a metal chain that extends from your bottom bracket/ pedals to the rear wheel of your bicycle, there’s a carbon fiber belt that works to drive your bicycle forward as you pedal. If you’re unfamiliar with the Pinion gearbox and the Gates Carbon Drive System, and you like to learn more about how it works, please see the detailed article I wrote on the subject. While you’re there, I encourage you to listen to the audio podcast I recorded about the Pinion gearbox and the Gates Carbon Drive System. Both the article and the accompanying audio podcast will teach you a lot about this new, modern, internal bicycle gearing system. To make a long story short, I chose to have my Siskiyou touring bike fitted with a Pinion gearbox and the additional Gates Carbon Drive System…. and I’m really quite happy that I did! To be honest though, I had some reservations about getting a bike with a Pinion gearbox installed on it. I had reservations because this technology is still fairly new. I wasn’t sure if I was going to get something that would live up to its incredible claims… and I worried that if the gearbox or the carbon fiber belt were to ever break while I was out on the road, it would be nearly impossible for me to fix. So, I definitely had some concerns about choosing this unique gearing system over the more traditional and proven chain and derailleur setup that I’ve had on my bicycles for my entire life up until this point. But in the end, I’m really glad I made the decision to add the Pinion gearbox to my new Co-Motion Siskiyou. 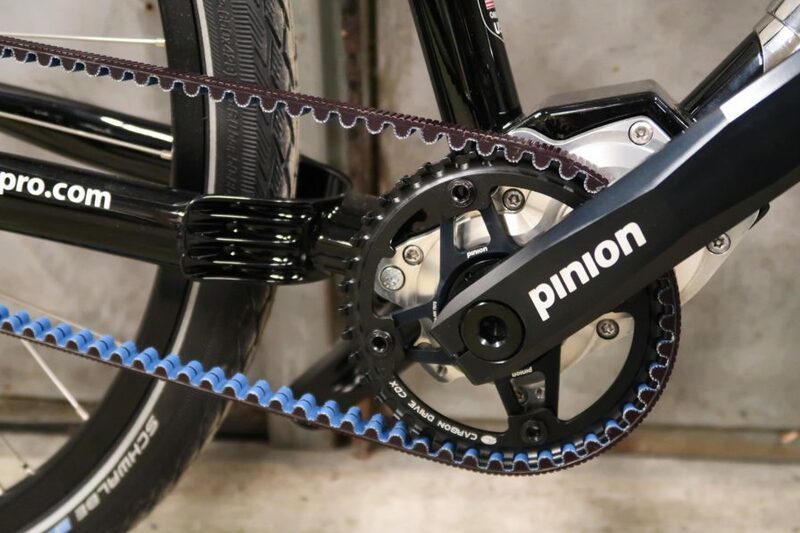 While adding the Pinion gearbox to your bicycle does make the bike significantly more heavy, it all but eliminates the regular maintenance that is required with a traditional metal chain and derailleur gearing system. And this alone (the fact that I can ride this bike for months on end without having to clean or oil the gears/belt) is the number one thing I like about the Pinion gearbox and Gates Carbon Drive System. It’s just so nice to not have to deal with constantly cleaning my chain, applying oil, getting my hands dirty, etc. All of those problems are eliminated when you ride a bicycle with the Pinion/Gates system installed. Have I had any problems with the gearbox or the belt? No, I’ve had no problems whatsoever. From the moment I received my new Co-Motion Siskiyou to this very moment almost one year later, I have not had a single problem with this bike. Not only has the gearing worked flawlessly, but I’ve never had a flat tire, I’ve never had to change the brake pads, and I’ve never done any other maintenance to the bike (other than just wiping it down with a towel). I love bicycling, but I really do hate the maintenance that is involved with riding a bicycle… and my Co-Motion Siskiyou with the Pinion gearbox and Gates Carbon Drive System has all but eliminated my need to regularly maintain my bicycle. Now I can simply jump on my bike and go… day after day… and enjoy the experience of riding my bicycle without having to constantly work to clean and maintain my ride. I’ve owned my Co-Motion Siskiyou touring bicycle for almost a year now and in that time I’ve received a number of different questions about the bike. How does the Co-Motion Siskiyou ride? How does it feel? The Co-Motion Siskiyou feels very similar to riding any other road bike. It’s a bit heavier than your traditional 700c road bicycle and may not be quite as fast (because of the larger tires and the larger contact patch those tires make with the ground), but otherwise, it feels a lot like riding any other road bike or road-based touring bicycle. Unlike most road bikes, however, the Siskiyou is comfortable to sit on and pedal for days, weeks or months on end, thanks to its longer wheelbase and touring-specific geometry. How much does the Co-Motion Siskiyou cost? How much does the Co-Motion Siskiyou weigh? My Siskiyou, with the 18-speed Pinion gearbox, front and rear racks, and two water bottle cages, weighs approximately 37.2 lbs (16.87 kg). The weight of your Co-Motion Siskiyou is going to depend, however, on the options you chose to add to your bike, which water bottle cages and racks you chose to use, etc. If you were to buy the Co-Motion Siskiyou with the SRAM Mountain Kit gearing, the weight or your bicycle would be significantly less. What sizes is Co-Motion Siskiyou available in? The Co-Motion Siskiyou is currently available in the following sizes: 46cm, 50cm, 52cm, 54cm, 56cm, 58cm, 60 cm and 62cm. Co-Motion does a really good job of working with you to find the bike that’s going to be best suited for you, so if you don’t know which size is best for your particular body type, just get in touch with Co-Motion Cycles directly or work with one of their local dealers. They’ll be happy to help you find the right size bicycle for you. Which paint colors are available? The Co-Motion Siskiyou is available in a number of different paint colors and styles. You can basically customize the bike to have it look however you want it to look! Co-Motion bikes are hand-made by a skilled set of bicycle makers in the United States of America, and when you order a bike from Co-Motion, the frame is built, your custom paint style is applied, and the components are then added. Click here and then scroll to the bottom of the page to learn more about the various Co-Motion Cycles paint color options. Why does the Co-Motion Siskiyou have drop handlebars? The main reason the Co-Motion Siskiyou has drop handlebars, I think, is because almost all 650b bicycles are equipped with drop handlebars. 650b bicycles are designed mostly for road-based cycling, so the drops come in handy for this particular style of riding. They’re fast, sporty and comfortable over the long-haul. Which do you prefer? 650b, 26 Inch or 700c wheels & tires? To be honest… it depends. If I knew that I was going to be cycling pretty much only on paved roads, I’d opt for a bicycle like the Co-Motion Americano, which is equipped with 700c wheels and tires. But if I was planning to cycle across Africa or South America, I’d probably chose to ride the Co-Motion Pangea with its 26 inch wheels that are easier to find in these particular parts of the world. But for a bike that is mostly road-based and can also handle its fair share of off-road riding, the Co-Motion Siskiyou and its 650b wheels and tires is honestly the perfect bike to ride. The big hesitation right now with 650b wheels and tires is that they are currently quite difficult to find at many local bikes shops. As the 650b wheel/tire size becomes more popular, however, we’ll likely begin to see more bike shops carrying tubes, tires, spokes and rims in this size. Why does the Co-Motion Siskiyou not have suspension on it? Very few touring bicycles come equipped with suspension of any kind. While suspension might make your ride more comfortable over bumpy terrain, this suspension would also work to drastically reduce your efficiency on the bicycle as you ride. Because the Co-Motion Siskiyou is a road bike first and an off-road bike second, it just doesn’t make sense to put suspension on this particular bicycle. Where can I purchase a Co-Motion Siskiyou touring bicycle? The best way to purchase a Co-Motion bicycle is to contact your local Co-Motion Cycles dealer – if you have one. Otherwise, you can contact the company directly. Their website is www.co-motion.com. Their phone number is (866) 282-6336 and you can contact them via email using the web form on this page. Is the Co-Motion Siskiyou available Internationally? While it is possible to purchase a Co-Motion bicycle and have it delivered to you if you live outside of the United States, there are some additional costs associated with the purchase. You will need to pay extra for shipping (and insurance, if you decide to insure the bike during its transport). Then you may need to pay additional customs and/or import fees. Each country is a little different in regards to how they handle delivery of bicycles. For more information on international orders, contact Co-Motion directly. Who should I contact if I have additional questions about the Co-Motion Siskiyou? If you have any additional questions about the Co-Motion Siskiyou that I have not answered here, please leave a comment at the bottom of this page, visit the official Co-Motion website at www.co-motion.com or give the company a call at (866) 282-6336. 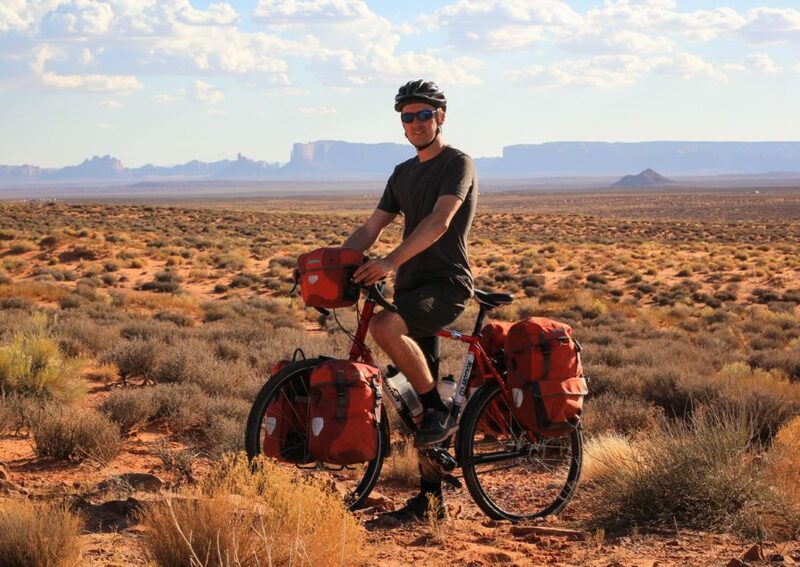 The Co-Motion Siskiyou is a high-quality on-road/off-road touring bicycle capable of round-the-world travel. The 650b wheels/tires make for an excellent road riding experience… while being both comfortable and fun when ridden off-road. The frame is comfortable and the handlebars and saddle allow you to sit on the bike for hours at a time. Gearing options include the SRAM 2×10 Mountain Kit, Rohloff 14-speed internal hub or with the 12 and 18-speed Pinion gearbox and Gates carbon drive system. The Siskiyou has excellent stopping power thanks to its cable disc-brakes, which not only work well, but are also very easy to adjust. Custom paint colors allow for a truly unique bicycle. Optional S&S couplers allow the bike to be split in half and taken on buses, boats, planes and trains at no additional cost. Parts for the 650b wheels and tires may be difficult or impossible to find in many parts of the world. Should something go wrong with your Rohloff hub and/or Pinion gearbox, it may be difficult or impossible to repair on your own. The bike only has mounts for two water bottles cage instead of the three you see on so may other long-distance touring bicycles. Finally, the price of the Co-motion Siskiyou may be outside the budget limitations of some individuals. 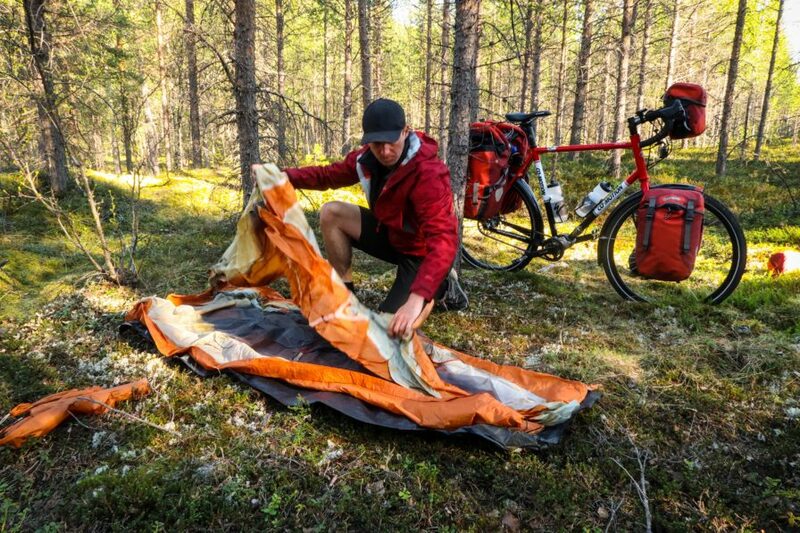 This entry was posted in Bicycle Touring Pro Articles, Bicycles, Featured Articles, Main Articles, Main Featured Articles, Product & Service Reviews, Touring Bicycles, Uncategorized and tagged 650b, 650b bicycle, 650b bike, 650b touring bicycle, best 650b bicycle, co-motion, co-motion cycles, co-motion cycles siskiyou, co-motion siskiyou, siskiyou touring bike, touring bicycle, touring bicycle review, touring bike, touring bike review. Darren, when are you going to Africa? (!!!) This fall or winter please. I have no plans for a return to Africa anytime soon. I do want to get back there though. I just don’t know when. Interestinng review on a bike that does things differently. I do find the choice of 650b to be bizarre. Great review. Glad to hear 650B has worked out well for you. Hello Darren, thank you for the informative review. I agree with you that the unusual wheel size will be a big drawback. If you are unable to locate tyres, etc, where you live in California you can pretty much forget it anywhere else in the world apart maybe from high end european bike shops. I love the idea of the Pinion centralised gearbox as it leaves wheel maintenance for punctures unaffected. I purchased a bike with the Alfine 11 speed hub gearbox with the Gates carbon drive which adds some extra complications when dealing with a rear wheel puncture. An advantage which also comes with the alternatives to standard derailleur gears is that the rear wheel does not require “dishing” with the spokes and so should be stronger and less prone to breaking spokes or failing. 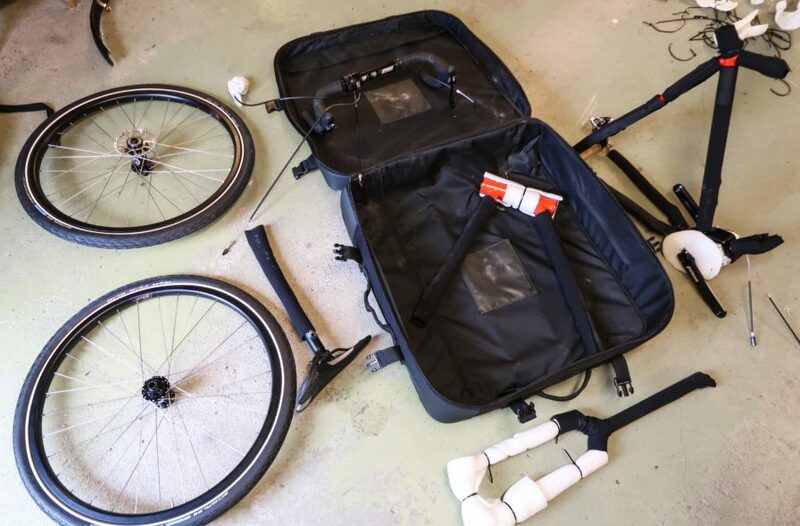 The S&S couplers are a great idea to minimize the transport size of the bicycle but having to look after an expensive bespoke bike case will give you the problem of what to do with it between flights. What do you do with yours? Overall though as, you highlighted, the fantastic advantage of low drive train maintenance is very desirable. Thanks for the review – good to remain “current”.